When he eventually reached for his pocket, he would find his coin hot and bent from the impact of the enemy’s bullet. On the tail side of the one-penny coin, there is a bold hollow which presses through to the flip side, giving the round disk the shape of a seashell. But within the hollow of this time-smeared coin lies a story which has lived for over 100 years, moving down from one generation to the next. Nevertheless, the world may not have known the story if this announcement had not come just a few days ago: the century-old coin is set to be sold off at an auction on March 22, 2019. This information comes from the Derbyshire-based auction house Hanson Auctioneers. The dented penny belonged to Private John Trickett, who served with the Northamptonshire Regiment of the British Army during the First World War. 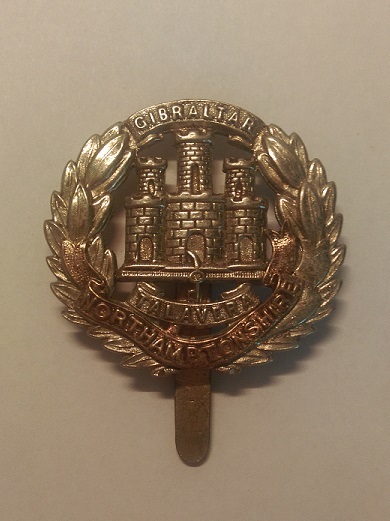 While Trickett served on the war front with his regiment, in what has long been a tradition among soldiers he placed a penny in his top left breast pocket. To him, the penny was a poignant reminder of home. 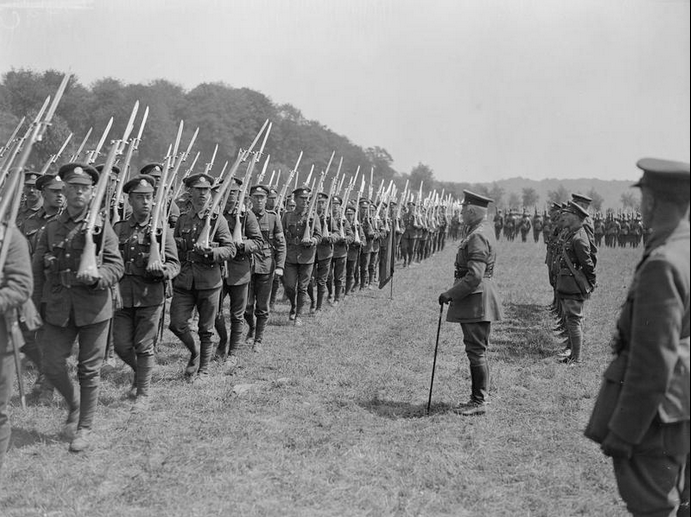 Troops of the 1st Battalion, Northamptonshire Regiment marching past Prince Arthur, the Duke of Connaught, at his inspection of the 2nd Brigade, near Bruay, 1 July 1918. 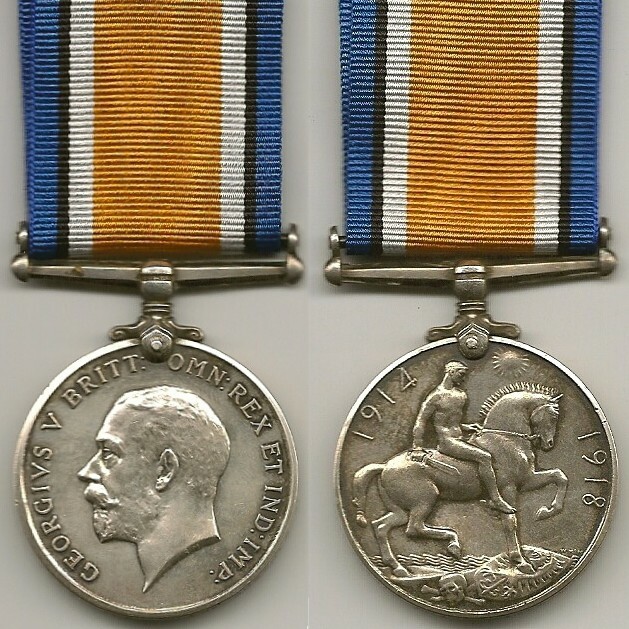 However, while his regiment fought on a French battlefield in 1918, the coin proved to be more than what it had been meant for. As the regiment clashed with the enemy, one of them aimed for Trickett’s heart and fired. But the shooter’s accuracy was broken by the piercing clink of metal crashing against metal. The impact threw Trickett off his feet as the bullet ricocheted off his chest, darted past his face, and pierced through his left ear. When he eventually reached for his pocket, he would find his coin hot and bent from the impact of the enemy’s bullet. This became his lucky coin. Trickett was left deaf in his left ear. He also had an injured left arm and developed a poor balance due to his injured ear. He was honorably dismissed from military service on September 7, 1918, close to the war’s end. Having lost his two brothers in the war which claimed the lives of over nine million military men, Trickett ultimately survived. And the coin had done more than remind him of home. It saved his life and stood as a passionate reminder of the battlefields long after the war was over. Minted in 1889, this treasured coin has gone through two generations, and is now ready to be sold at an auction on Friday, March 22, 2019. Having examined the dented coin, Hanson Auctioneers’ militaria expert Adrian Stevenson said that the bullet appears to have struck the coin at close range. “I’ve come across many stories of random objects saving soldiers’ lives but I’ve never seen anything like this before,” he added. 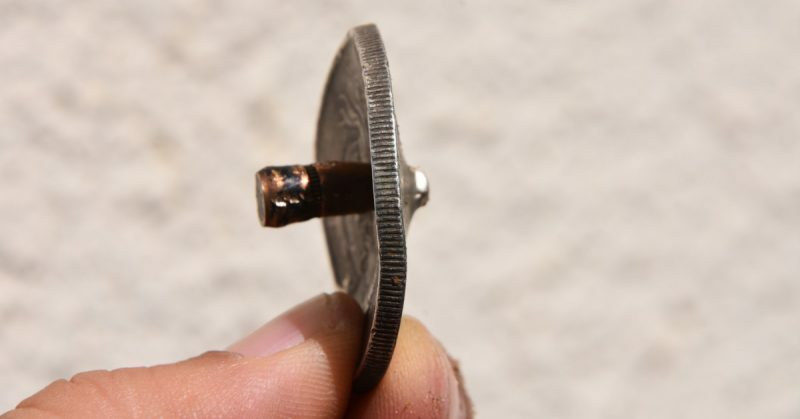 He affirmed that since soldiers have always been known to keep objects in their breast pockets as protection against bullets and shrapnel, it is possible that Trickett had kept the penny there partly for that purpose. The penny, along with Trickett’s British War Medal and Victory Medal, is being sold by his granddaughter Maureen Coulson. She described her grandfather, John Trickett, as a big guy who was as soft as a brush. “It’s strange to think that, but for that penny, his children would not have been born and I wouldn’t be here,” she said. John Trickett was born in 1899 and was around 15 years old when World War I broke out. He may have successfully enlisted with the British army at that age owing to his brawny stature which made him look older than he actually was at that time. After his honorable discharge from military service, Trickett settled down and married a woman who would become Maureen Coulson’s grandmother, who gave birth to eight children. With the war now behind him, Trickett worked at a post office as a postmaster, and then at Barnburgh Colliery in South Yorkshire as a switchboard operator. Trickett collapsed while at work in 1962, and that led to his death at the age of 63. Trickett’s items are part of Hansons’ Medals and Militaria March collection, and will finally be sold five decades after his demise. Having been slated for auction at Heage Lane, Etwall, Derbyshire, the value of this collection is estimated to be between 100 and 200 British Pounds. Other items in the collection include a printed discharge certificate which shows that Trickett was honorably discharged on September 7, 1918. Currently, there are 31 bids amounting to 1,250 British Pounds. However, this figure is expected to increase before the deadline.